WT Centennial Sustainability Campaign: Earth Day Event! Thanks to the generous contributions of The Wheeler Family Foundation and local artist Mark Rumsey, Wealthy Theatre is pleased to announce "Sustaining History – WT Earth Day Event!" Receive original Mark Rumsey print as thanks! All donations go toward the Wealthy Theatre Centennial Sustainability Campaign. 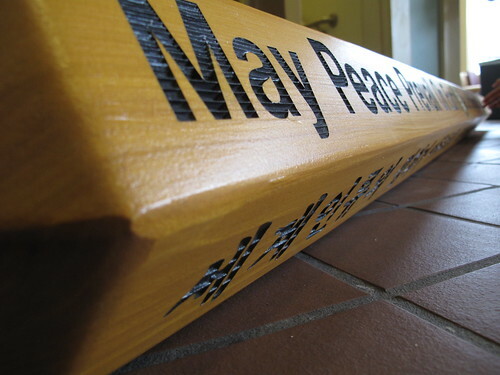 The three week fundraiser will culminate with the installation of a new 12-language peace pole in the WT walkway. 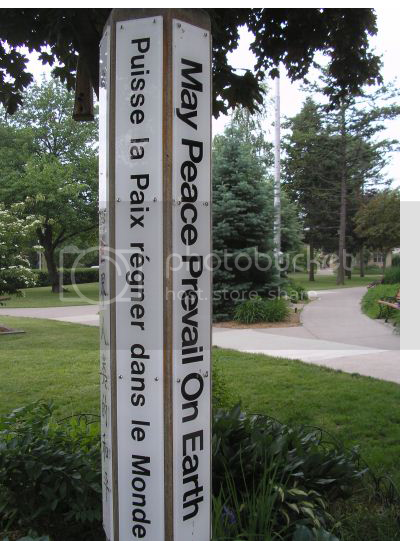 The peace pole and specific languages selected were chosen in rememberance of GRCMC Founder Dirk Koning. Creation of the walkway and adjacent garden area was made possible through the generous support of the Dyer-Ives Foundation. 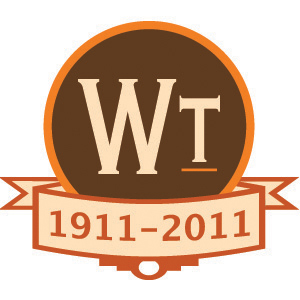 Between April 1 and Earth Day (April 22, 2011), The Wheeler Family Foundation will match donations to the WT Centennial Sustainability Campaign 1:1 up to the amount of $1,130. If you support the Centennial Campaign during this time, we'll say "thank you" with a unique wood-block print by artist Mark Rumsey, or you could choose any of the regular thank-you items here. 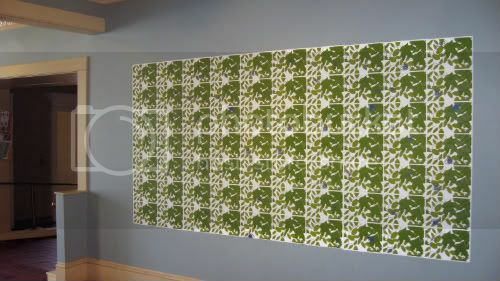 Above is an image of Mark's exhibit from Belgium. 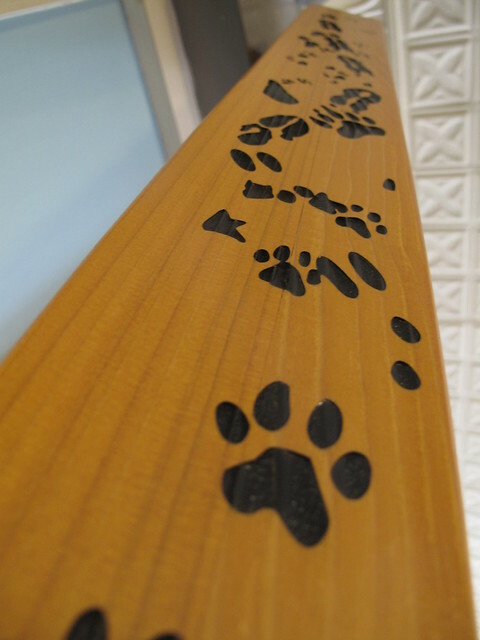 This is a sample image of the type of peace pole that will be installed in the WT walkway at Noon on April 22, 2011. 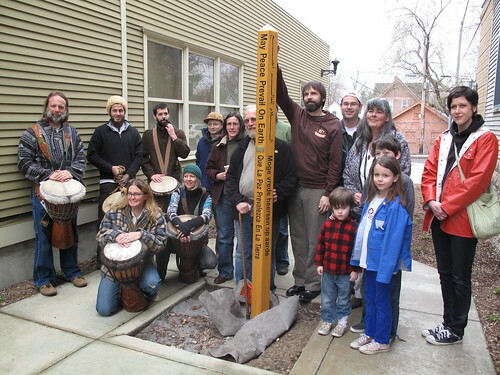 The installation of the peace pole will include refreshments, a brief drumming circle and socializing with friends - an enjoyable way to spend your lunch break on Friday (4/22)! So how can you help? Show your support for the WT Centennial Sustainability Campaign by donating online or calling us at (616) 459-4788 x130. 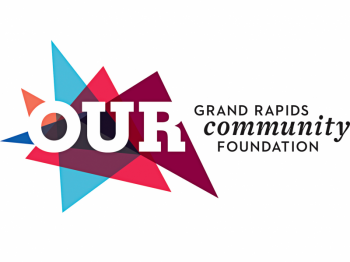 All contributions go toward our overall $500,000 Centennial Sustainaibility Campaign goal. The Centennial Sustainability Campaign is explained in detail here. Visit WT at 1130 Wealthy Street SE! 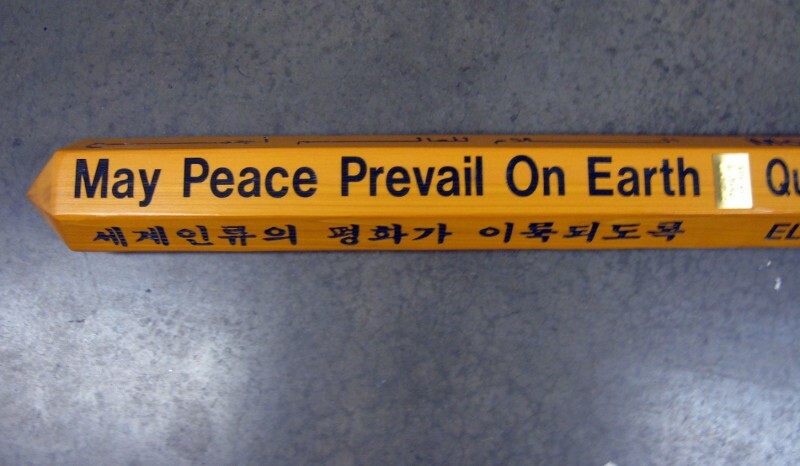 Can't wait for the Peace Pole installation! Also, those prints from Mark Rumsey are amazing. Anyone who has thought about donating before, now is your chance... matching donations plus a Rumsey print!